Personally, I'm kind of at an interesting time right now. Since late last summer, as I know I've mentioned a couple times on here, I've been following the paleo diet for the most part, and since then, between diet and running, I've dropped seventy pounds. Two weeks ago, I celebrated hitting the weight loss century mark since my known height from back in December 2012 - yes, 100 pounds, over a foot off my waistline, two shirt sizes, and lots of blood sugar/blood pressure/cholesterol points gone. Allow me this not-so-humble brag...daaang. I've always been the "fat kid" growing up, and dang it, it feels so good to not be that any more - even clinically speaking, I am at a "normal weight" now, and I continually have to shush my coworkers who claim I'm wasting away to nothing. Of course, paleo diet means no carbs (at least not the bready kinds), but I'm going to try and shift myself into weight maintenance as opposed to weight loss mode. My clothes budget can't take it any more. So I'm going to try to reintroduce them, on a limited and controlled basis, and fall back on my caveman ways if need be if I go up a few too many clicks. Still, after avoiding and going to great pains to mostly avoid for so long, it's a difficult mindset to try and re-adapt to, that carbs (like most anything) are okay if you don't over-indulge. 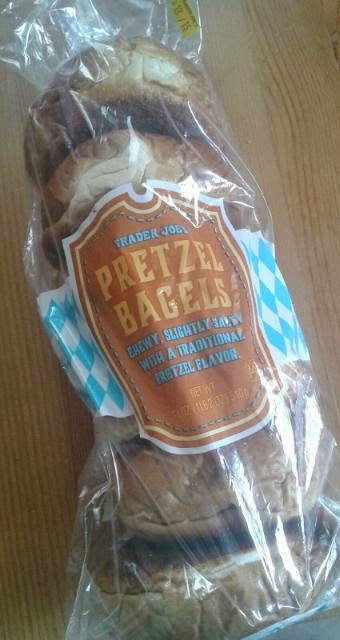 With this mental banter banging around, when I first saw Trader Joe's Pretzel Bagels up on the shelf near the checkout, my first thought was "Hey that's not fair!" 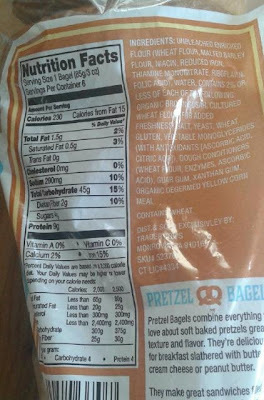 Pretzels are fantastic (usually) and bagels are divine, so combine the two and....but my brain wanted to tell me they weren't okay. I mentioned all this to my lovely wife, who sighed, rolled her eyes, grabbed the bag and tossed them in the cart, saying "You're gonna eat these, buster." I wish I liked these more. I really do. They're not bad. But they don't strike me as overly pretzel-y or bagel-y, but instead are some weird doughy crossbreed trying to masquerade as both and failing. A good bagel and an acceptable soft pretzel to me are at least somewhat similar in texture to me - tough, golden outside with a dense and chewy interior, like a New York-style bagel or a Philly soft pretzel. Not these guys. I haven[t had the TJ's soft pretzel stick, but I'd imagine these are much the same, except in an O shaped form. It's so much more bread-like than either pretzel or bagel. To really enjoy them, I have to say, you have to toast the bagels. It's a must. It's only by toasting that the exterior gets a little crispy, with the inside deflating to a chewy texture that somewhat approximates the proper experience. Indeed, when we made some ham and gouda melts for lunch on them, or some toasted breakfast sandwiches the following morning, they were pretty fantastic and added a lot to the meal. But if you were to take a bite of one right out of the package, really, it just tastes like normal bread with a super soft semi-pretzelesque exterior. Other than that, although we enjoyed them, both Sandy and I have a few small quibbles. Sandy thought that, in line with the whole "pretzel" thing, they should have a little more salt to them. I agree that it'd be a nice touch. And also, and this just shows how petty I am, these bagels are not presliced. I hate slicing bagels, mostly because I have to decide between the perceived inconvenience of cleaning a cutting board or the risk of running a serrated blade across my palm. No, I will not buy one of those stupid bagel slicing contraptions. Anyways, a six pack will set you back only $2.49, which is reasonable enough. Chances are good we'll get them again when we need a mix up from the normal slabs of bread. Sandy liked them a tad bit more than me, saying that all the way around, they tasted like a pretzel enough to her liking. She's going with a four. Maybe I'm just being too picky, or just wishing that one of my first forays back into regular carb-dom would be a little more satisfactory, but I'm going with just a three. Tried these this week and REALLY like them! They really need to be toasted, but then the texture is great--brings out the pretzel flavor too. I also liked them better with a little salt added. But these make a great toasted/buttered/salted snack, and great for bagel sandwiches. Toast, spread avocado on it, top with sliced hard boiled or over hard egg. Delicious. Congrats on the healthier living! Russ, would you consider doing a blog post detailing what your favorites and go-to foods from TJ's were while you were eating paleo? I also have about 100 pounds to lose, and I refuse to shop anywhere but TJ's, so it would be great to get input from someone who has had so much success. Congratulations on the weight loss!!! May I interject and say you're doing it all wrong? You have to toast them WHOLE (don't slice) and them in half (the opposite way, not down the center) and enjoy them with tofu/ or egg scramble and a salad. Trust me, it'll taste more like a pretzel, but in the way breakfast would want you to have it.